The Graduated Filters in Color Efex Pro 4 simulates the use of traditional glass graduated filters, commonly used to enhance skies in landscape photos. 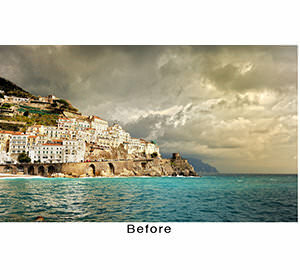 Using this particular filter allows you to achieve these enhancements in your digital darkroom, without having to carry an abundance of filtration options with your camera gear. Looking closely at the filter controls below will give you a better understanding of the digital equivalent available in Color Efex Pro 4. Color Set offers a drop down menu that enables you to control the color of the graduation applied to the image. There are 4 Color Set categories, each offering 4 different hue options. The default Color Set is Blue, Option 1. Opacity allows you to increase or decrease the effect of the filter in the image by controlling the overall filter strength. The default value is set to 75%, giving the image a pronounced effect to begin with. Blend controls the transition of the filtered effect and defaults at 33%. 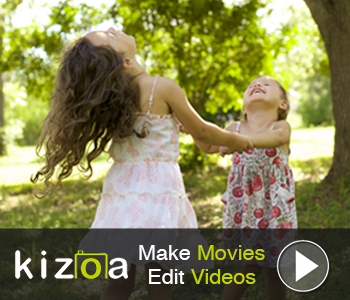 Moving the slider to the left creates a sharp transition, while moving the slider to the right softens the transition. Vertical Shift is used to place the horizon (line) within the image and can work in conjunction with Blend. 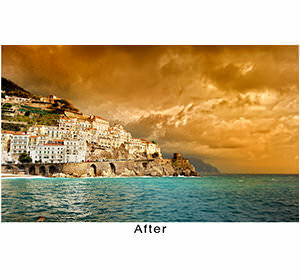 Moving the slider to the left will raise the horizon that has been added to the image, while moving it to the right will lower the horizon. It is set at a 40% to begin with. Rotation is set to 180°, placing the horizon level across the image with the graduated color at the upper half of you image, blending inward. Moving the slider simulates the effect of rotating a filter on your lens. In this instance, moving the slider left will rotate the horizon to the left and moving the slider to the right will rotate the horizon to the right. Tip: Set the Blend slider to 0% and then use the Rotation slider so that you can match the horizon, or effectively cover the sky, within your landscape image. Once set, you can then increase the Blend percentage to achieve the desired transition.